Programmable with over 100 built-in functions. Stylish protective carrying case included. Casio FX-7000GB Scientific Graphics Programmable Calculator. It is in good working order. Comes with pouch. Will post by Royal Mail recorded delivery. The battery however is 40 years old and has never been rebuilt. We do NOT accept non sterling cheques/money orders. Solid state software cards & holder. Casio FX-7700GE Programmable Graphic Calculator. Other features include line, magnification /reduction, coordinate range designation, overwrite and polar coordinate graph. Also included is base conversions/calculation, logical operation, regression analysis and integration. The Casio CFX-9800G Color Power Graphic is a graphing calculator with 10 digits precision and formula input logic. It has an unknown number of functions, 58 keys and an LCD (liquid crystal) display. HP 40GS Graphing Calculator. HP 40gs is built for performance! Easy to use, powerful HP Graphing Calculators are designed to perform above expectations for students and professionals on all levels. New and improved "HP feel" keyboard. I've put 2 batteries in and it works, dont' think it has been used much. Advanced graphing features including mulitple styles. Probability distributions. Programmable in different languages (TI-BASIC, Assembly). Yes, I am in Co Armagh, Northern Ireland, United Kingdom. LCD screen features 64 x 96 pixel resolution for clear, readable display. Type Graphing. Casio FX-7700G Programmable Graphic Calculator. Year introduced 1993. RUNS ON 3X AAA BATTERY (WILL INCLUDED BATTERIES ). RUNS ON ONE 9V BATTERY (NOT INCLUDED ). Calculator in good working order as shown. Comes with original box and manual although fairly worn and sellotape applied. Battery connector has masking tape applied as plastic split. No problem fitting battery. Casio CFX-9800G Color Power Graphic Scientific Programmable Graphing Calculator. Condition is Used. Dispatched with Royal Mail 1st Class. 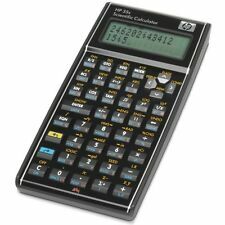 Hewlett-Packard HP 12C RPN Financial Calculator – FREE P&P!!! Full range of financial functions (you can look these up online at hpmuseum.org). The calculator is also. In really excellent condition: the only blemish is a small, almost-imperceptible scratch on the brushed aluminium above the display. Hewlett-Packard HP-41 CV programmable calculator HP-41CX And Time Module! It's a rare one. It powers on fine and is all ready to use. Hewlett-Packard HP-41 CX programmable calculator HP-41CX And Three Modules! I do not send reminders. ANY REQUESTS FOR AN INVOICE WILL BE IGNORED. FURTHER INFORMATION BELOW. It was a milestone in the history of pocket calculators when Casio introduced with the fx-7000G the world's first Graphing calculator. "The Casio fx-7000G is notable for being the world's first graphing calculator. Complete with English User Guide/Manual (232 Pages). It is in Full Working Order with Large Display see scans. Sinclair Scientific Programmable. With adaptor. Advanced graphing features including mulitple styles. Probability distributions. Programmable in different languages (TI-BASIC, Assembly). LCD screen features 64 x 96 pixel resolution for clear, readable display. Texas Instruments TI Nspire CX Graphic Calculator. Dispatched with Royal Mail 1st Class. TEXAS INSTRUMENTS TI-83 PLUS CALCULATOR Graphic Scientific Calculator Programmable Great Working Condition Free UK Delivery. 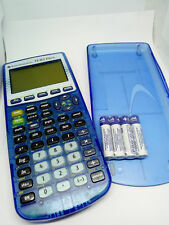 The calculator is supplied with slip case. We do NOT accept non sterling cheques/money orders. TI-84 Plus Graphic calculator (Silver Edition). Good condition, includes manual and USB cable. Review of the calculatorhere. Available on Amazonhere (for £116) - grab yourself a bargain! 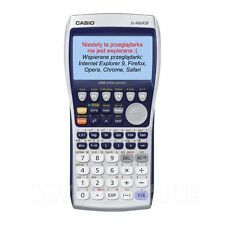 Casio fx-CG50 Graphic Calculator Accepted For A Level Condition is New. Dispatched with Royal Mail 1st Class (1 to 2 working days). NO BOX OR MANAUL. NO BATTERIES ITS TAKES 4 AAA. Propotional Graph(Pie chart, Stacked graph). Casio GRAPH 25 (fx-7400G, fx-7450G) [pics are of actual item]. • Graph mode. • Table and graph. • Variables: 26. More info about this calculator can also be found online from the TI website. It features USB connection, 3D Graphing, CAS and a whole load of other advanced scientific functions. Bran new item. We do not provide English Manual. NOTE: Requires 4x AAA batteries (NOT Included). Ability to import digital images onto the handheld screen as well as in the computer software. Compatibility with Casio data projectors enables the fx-9860GII SD / fx-9860GII’s display to be easily projected up onto a screen. Extracted data can be analyzed by transferring it to the graph function calculator. SHARP EL-9600 GRAPHIC CALCULATOR BOXED WITH INSTRUCTIONS. Dispatched with Royal Mail 2nd Class. Item is in new but opened condition. Batteries have been placed inside to confirm working but nothing else has been used/tested. WILL NOT BE SHIPPED WITH BATTERIES due to postage laws. Complete with instructions and stylus. Great item to have in an office or at home. Please see all photos. Thank you for viewing. TI-Nspire works with all major interactive whiteboard technologies. Users can also split the screen enabling up to four applications to be viewed simultaneously. USB port supports handheld to handheld communication and connection to a computer or other presentation technology. Complex numbers calculated to 14-digit accuracy and displayed with 10 digits plus 2 digit exponent. The screen has a horizontal and vertical split along with screen options. Calculator face and buttons are in good condition and there is scratching to the outer cases. In good as new condition. Only been used for a few days. Comes with a USB cable. 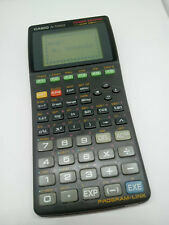 Genuine Casio FX-5800P Scientific Calculator Best in ebay!